ONE WEEK after drug dealers and gangsters started a campaign of arson and robbery in Rio de Janeiro, Brazilian security forces have entered the Complexo do Alemão, a group of 12 favelas (shantytowns) where the ringleaders are hiding, in an effort to reassert the state’s control over the area. Around 2,700 police and soldiers began laying siege to the slums on November 25th, and gave their adversaries a deadline of sunset on November 27th to surrender. This morning, they stormed the neighbourhood, and met surprisingly little resistance, as some of the criminals fled to the hills above. Among the 30 or so arrested so far is a gang leader known as Zeu, who was wanted for the torture and murder of Tim Lopes, an investigative journalist, in 2002. The wave of violence started on the night of November 20th, when the gangs began hijacking and burning cars and buses to cause fear and disruption. Since then over 40 people have been killed—mostly suspected traffickers, but also some innocent bystanders, including children, who have been hit by stray bullets. The authorities believe that the attacks were a reprisal for their gradual retaking of the lawless favelas in recent years, by expelling drug dealers and gang members one slum at a time, and preventing their return by installing permanent “Pacification Police Units”, or UPPs. Even though barely a dozen of the hundreds of favelas have been reclaimed so far, the drug lords are clearly already feeling the pinch. Police say a note found by a burning bus on November 24th explicitly linked the campaign, the UPPs and the 2016 Olympics, due to be held in Rio: “with UPPs, no Olympics”, it read. The city has responded with overwhelming force to a threat that its mayor, Eduardo Paes, has described as terrorism. It has called in its off-duty police and put those with desk jobs on the streets, while turning to the federal government for military firepower and help controlling the major routes to and from the city. On November 24th the police raided Vila Cruzeiro, another large favela. Broadcast live by Globo, a television network, which had moved its helicopter from São Paulo to film the action in Rio, some hundreds of gang members were seen toting weapons and ammunition from Vila do Cruzeiro to Complexo do Alemão, where they then holed up. The implication that the city’s normally warring drug gangs were teaming up to fight the government (Amigos dos Amigos have their headquarters in Vila do Cruzeiro; Comando Vermelho in Complexo do Alemão) was worrying. But after a fierce but short shoot-out, lasting around half an hour, the siege was over. Down on the “asphalt”, as favela-dwellers often refer to the swish seafront areas, after a few shaky days with businesses closing early and taxis hard to find, life is by now pretty much back to normal. “Nothing to do with here,” said one resident; another said she was lunching inside restaurants, rather than on their terraces, at least for now. But there was general approval. Many locals referred to the action as a long-overdue “civil war”. The governor of the state of Rio de Janeiro, Sergio Cabral, was recently re-elected easily for a second term in part because of his plans to improve public safety. 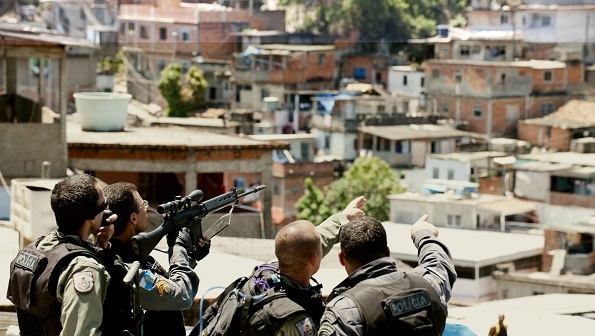 What seems new is that the residents of the favelas themselves seem to be welcoming the police. Not that they are particularly keen on the gangsters and militias who rule their neighbourhoods, but the police, who tend to mount violent hunt-and-search operations with little care for bystanders and then pull out again, have managed to be even less popular. That seems to be changing as the UPPs stay put. Favela-dwellers appear to be slowly allowing themselves to hope that this time, when politicians and police say they are here to help, they mean it for more than the short term. This entry was posted in Article review, Brazil and tagged alemao, favelas, shantytowns, UPP. Bookmark the permalink.